Annabel Lyon. Imagining Ancient Women. Henry Kreisel Lecture Series. Edmonton: University of Alberta Press, 2012. The end of December and beginning of January is always my favorite time of year. Not because of the season—I’m more of a leaf-peeper than a snow-lover—but because it is inevitably a time of transition. Say what you will about the futility of New Year’s Resolutions, the chance to look back on the year that has passed and look forward to the year to come is a gift. One tradition I have for this liminal time is to look up my favorite authors to see whether any of them will be publishing books in the new year. Often I’ll also discover older works of theirs that I haven’t yet read. I made such a discovery while looking up Annabel Lyon. I’ve written before about her second novel, The Sweet Girl, and its wonderful approach to women of the past. 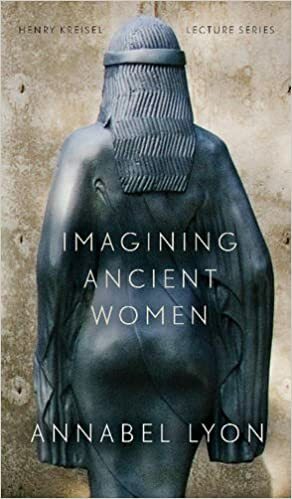 So I was delighted to find Imagining Ancient Women, a published version of a lecture Lyon gave at the University of Alberta in 2010, and read Lyon’s own thoughts on the possibilities and risks of historical fiction about women. Lyon begins with the broad suggestion “that literary fiction is uniquely poised to perform an important ethical function in our lives—namely, to teach us compassion, a deep and lasting understanding of the other—and that historical fiction, with its particular tradition of focusing on moral problems and injustices, offers a particularly interesting tool for performing that function” (6-7). Because of this, historical fiction is prey to a number of didactic pitfalls, including “easy moral outrage; forbidden love; and excessive decoration” (7), all of which she later gathers under the umbrella of escapism (44). As an avid reader and would-be writer of historical fiction, these are familiar problems. I need only look in my own creative writing drawer for an outline of a tale involving a Puritan physician who falls in love with a Catholic woman and helps her to act on a stage which is forbidden to her as a women and abhorrent to him as a Puritan. There are even enthusiastic lists of the names of diseases (“flux,” “burnt blood,” “wolf”), Elizabethan slang (“shog off!”), and various articles of period clothing. Lyon gives some beautiful examples of novels which avoid these problems, then turns to her own problems imagining herself into the confined world of Greek women.”To an ancient Greek,” she claims, “I am a man….I operate in my society with all the freedom that a man in the ancient world would have operated in his” (20). She admits that she has difficulty understanding “how every last ancient woman wasn’t driven by the strictures in her life to suicidal depression” (33). Rather than taking the morally easy route of presenting an ancient woman who rebels against these strictures, or is in fact driven to despair, Lyon gives her character all the options available to her in antiquity, taking her cue from Sarah Pomeroy’s Goddesses, Whores, Wives, and Slaves. Pythias becomes a priestess, a midwife, a hetaira, and, eventually, a wife. Lyon beautifully describes Pythias as “my Philoctetes, the creature who both repels and inspires compassion, the ancient self I can choose to befriend, and enrich my own modern life thereby” (51). In other words, Pythias and her author are both looking forward and back with a Janus-like attention to both modernity and antiquity. To “inhabit the past” (51) we need just enough anachronism that characters are recognizably and sympathetically human, but not so much that we retreat into a complacent moral high ground.